Population 15 million; Majority Human. Prominant businesses Industry, chemical manufacturing, service, information, transportation. In winter, the flying leaves of Jiàngluò's famed butterfly trees bleach white as they go dormant for the season, only recovering their resplendant colors in spring. Jiàngluò is a near Earth-sized world that orbits a blue-green ice giant planet, Zhǔ, as a moon. Several smaller moons are also visible in Jiàngluò's sky. Zhǔ orbits a white star just slightly smaller and cooler than Earth's sun. Jiàngluò is tidally locked to Zhǔ, so the cool blue-green orb of the ice giant always hangs in the same place in the sky. This also means that the "months" (the time taken to orbit the planet) are the same length as the days (the day-night cycle due to the rising and setting of the sun). Eclipses are common in spring and fall, lasting up to 7.8 kiloseconds (just over two hours) when they occur. Jiàngluò is currently in an ice age. Ice caps cover significant portions of the land in the north and south. Most settlements are in the tropics or sub-tropics where the climate is more pleasant and suitable for Earth crops. The dominant native life has a life cycle unusual by Earth standards. There are two stages of life for each species – a diploid stage, where each cell has two copies of each chromosome, which produces haploid "offspring" asexually, where each cell has only one copy of each chromosome. The haploid stages usually look quite different from their diploid "parent", and find other haploid stages of their species to mate with in order to produce new diploid organisms. Often, but not always, the diploid stage is sessile; the haploid stages are nearly always motile. It is common for the haploid organisms to remain in the vicinity of their diploid parent, guarding it and forming a cooperative nest or colony. This can go as far as eusocial arrangements, where the diploid nest queen produces haploid offspring of different casts that have different functions in the colony, from gathering food to nest defense to reproduction. Jiàngluò's autotrophes are animals with this diploid/haploid split, where the haploid stages form a symbiosis with a photosynthetic algae. These are the famous "butterfly trees". The diploid stage is a sessile creature that grows like a plant, sending roots down into the ground and sending up a stalk or stem which commonly sprouts branches. The diploid offspring act as the leaves, resting on the limbs and trunk. As they spread their wings to the sun, they synthesize food which they deliver to their parent through stomata in the stems. When disturbed, the leaves can take off in flight, rising as a great cloud of color and beating wings. Many are fully capable of defending their nest and parent, delivering painful bites or venomous stings against those who get too close. 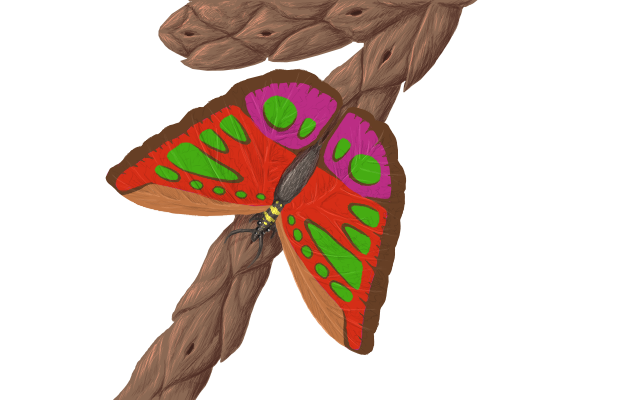 The butterfly leaves sport many different photopigments – red, brown, orange, yellow, and purple in addition to the green of chlorophyll – leading to a profusion of patterns and color in Jiàngluò's forests. Smaller versions are found as butterfly shrubs and butterfly weeds, making walking across an open plain a vibrant and kinetic experience as thousands upon thousands of leaves take off into the air in advance of your progress. The tubegrasses are another class of native autotrophes. The diploid stage spreads underground like runners, and the haploid offspring have a similar symbiotic relation with their parent as the butterfly trees. The long, tube-like haploid stages do not fly, however. If disturbed, they retract down below the ground inside their parent. The "leaf" of a butterfly tree, wings spread to the sun, docked at a stomata of its parent tree. A butterfly tree, with its swarms of flying leaves. Jiàngluò was initially one of the farthest outposts in the Chinese expansion. 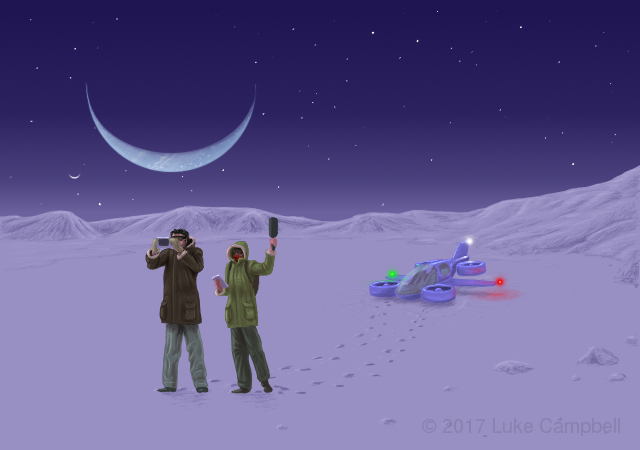 A cold, distant world, it was originally sparsely settled by dissidents and malcontents, those on the losing side of political battles, and minor criminals. This changed with the Chinese annexation of the worlds now known as the Verge. The capture of nearly a dozen productive and prosperous American colonies via a wormhole through Jiàngluò led to a buildup of military and administrative personnel. Not trusting the restive American worlds, Jiàngluò became the sector capital – close to the subject planets, but safely Chinese in culture and government. This immigration boom was halted when the Americans recaptured their worlds, with the unexpected addition of Jiàngluò and its immediate downstream neighbor in the wormhole network, Zhǎngshān. Once again, Jiàngluò found itself on the periphery, but this time with a much larger population and industry. American military forces occupied the world and installed their own government, managing Jiàngluò as American territory. Unrest was quickly dealt with, and Jiàngluò never managed to mount an effective resistance. The people of Jiàngluò quickly learned to leverage their manpower and industry, trading with the American worlds and the United States itself. The infrastructure built up as a sector capital served them well for servicing the young frontier worlds of the Verge. No longer a center of government, Jiàngluò became a center of trade and manufacturing. Jiàngluò's citizens soon came to appreciate the wealth coming to their world, and life looked good. After the Bump in the Night, the industrial capacity of Jiàngluò proved vital to getting the Verge up and running again. Having gotten used to a representative government, with long established trading relationships with the Americans, and worried about the Zox and Squirm, Jiàngluò became an enthusiastic supporter of unification with the other worlds of Human Space to form the Verge Republic. Still, many Jiàngluòese worried that their culture and traditions would be trampled by the American-dominated culture of the other worlds of the republic. At the Constitutional Convention, Jiàngluò delegates made sure that the Republic Constitution gave explicit legal protection for the right to one's own culture and language as well as religion. This settled, Jiàngluò happily signed to become the first charter member of the Republic. As with most worlds in the Republic, Jiàngluò's world government is also a republic. It has an elected governor in charge of executive decisions, a bicameral legislature, and an independent judiciary. Uniquely, it also has two other branches of government – a civil service examination agency (based on the imperial examination system used in ancient China), and an audit agency to make sure the other branches are doing their job properly. People generally trust the government to act in their interests, and are more willing to sacrifice individual freedom for the common good than the worlds descended from American culture. Jiàngluò has little corruption compared to many other worlds in the Verge, with a transparent government and guaranteed access for citizens. Throughout the Verge, Jiàngluòese auditors are respected by the people and feared by the powerful for their reputation of incorruptability and tenacity. Many worlds like to hire Jiàngluòese marshals, sheriffs, police chiefs and commissioners, and judges for their perceived trustworthiness and dedication to rule of law. Each Jiàngluò day is split into two "cycles" of 21.2 hours each. Most people sleep and wake according to the schedule of cycles. Consequently, they will alternate cycles of daylight and nighttime during their waking periods. Most Jiàngluòese use artificial daylight-simulating alarm clocks to help them wake up during the night cycle. Since the timing of a cycle is a bit shorter than the natural circadian rhythm of a Human, medications are often used to allow a healthy sleep-wake pattern – including heavily caffeinated teas during the morning. Cycles are subdivided into hours and minutes. Metric time, and CNT, is only kept when coordinating activities with other planets. Jiàngluòese are primarily descended from Chinese, and thus tend to have Asian features, straight dark hair, and brown eyes. As there has been gene flow from the rest of the verge, a minority of Jiàngluòese have European, Hispanic, or African contributions to their appearance. The trend of cosmetic gene modification from before the Bump in the Night did not pass Jiàngluò by. By far the most popular modification is for pale skin. This does not grant European features – the facial structure remains characteristically Asian, and the hair and eyes remain dark, but the skin becomes nearly porcelain white. People with this genetic heritage do not tan, and are more susceptible to sunburn than normal. It is, however, considered attractive in Jiàngluò culture and as such has spread to a significant percentage of the population. Those with only one copy of the gene will simply be fair skinned and find it difficult to tan. A Jiàngluòese is expected to respect his family and elders, uphold his family name and honor, conform to the norms and expectations of society, and respect and obey the authorities (who are, after all, undoubtedly only looking out for the common good). At the same time, entrepreneurial spirit is encouraged and respected. A successful business leader is expected to run his company as a good corporate citizen; generally employees are expected to show unflinching loyalty to their company which will be returned by loyalty from the company (generally in the form of job security, health care, child care, generous pensions, and other benefits). The education system of Jiàngluò often emphasizes getting the right answer over independent thinking or problem solving skills. Consequently, many Jiàngluòese are reluctant to speak up for fear of being wrong. In built up urban areas, the demand for floor space means that most buildings are built on modern lines, with the multi-story edifices packed cheek-by-jowl amid the bustling crowds. When space is less constrained, traditional Chinese architecture is common, with its balanced and hierarchical design and sloping gabled roofs. Most Jiàngluòese buildings are planned by considering the fēng shuǐ of the design, in which the flows of the spiritual essence qi are taken into consideration. Some merely find that the fēng shuǐ results in a pleasing and relaxing arrangement, while others believe that the proper flow of qi is vital to the well-being, prosperity, and health of the building and its inhabitants. Jiàngluòese cuisine is based on the food of old China. Staples are rice, noodles, and wheat; combined with chopped vegetables, meats, and seasonings and cooked in a wok. Food may be cooked inside of dumplings or buns. Dairy is rare, except in ice cream. It is not considered appropriate to use a knife at the dinner table, so food is prepared so that it can be eaten with chopsticks alone. Dishes are prepared to be shared by everyone at the table, taking what they need from a central platter or bowl. There are many different cooking traditions based on this general style, largely arising from regional cuisines from old China. Tea is very popular in Jiàngluò, and is served with most meals. There are many different varieties of tea, and Jiàngluòese will be familiar with all of them and conversant in the benefits and properties of each. The native language of 90% of Jiàngluòese is Mandarin. Of the remainder, most are English or English/Spanish speakers who have immigrated from elsewhere in the Verge, although there are enclaves of Cantonese and Hokkien speakers. Almost everyone also speaks English, which is taught in schools starting from elementary school. The Mandarin of Jiàngluò is still written with Chinese characters, unlike in much of the rest of the Verge. On Jiàngluò, they use the simplified characters developed on mainland China in the mid 20th century of old Earth. Jiàngluòese are also taught the pinyin romanization of Mandarin words, and pinyin writing is not uncommon on displays, signs, and menus. Most Jiàngluòese are Buddhists, albeit with a significant fraction of Christians. Many are also Taoists, as there is generally not seen to be a conflict between Buddhism and Taoism. Although not exactly a religion, Confucian ideals permeate Jiàngluò society. 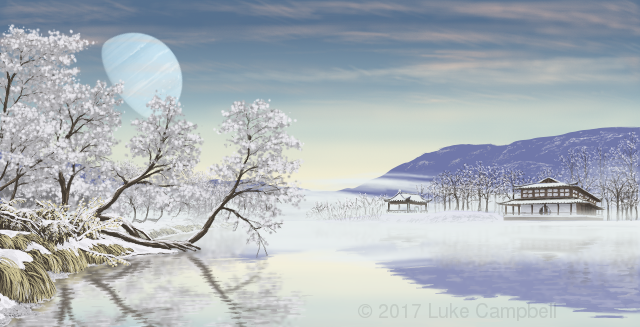 Beliefs about the importance of qi influences not only architecture (see above), but also many practices of healthy living and lifestyle. For Jiàngluòese, exercise can be an act of spirituality as they seek to enhance and direct their flow of qi. This is reflected in many martial arts and in practices such as t'ai-chi and qigong.